Considering the other two threads are for Mutant and for general purpose, i thought i'd make one specifically for changeling. for anyone that wants the book: the only torrents i can find of the core book include basically the entire Old World of Darkness book collection, so if anyone wants just the core book and nothing more, i can provide. (i'd provide you with the torrents i used for my information, but i got them from demonoid, so.....yeah.) I can provide basic character sheets and race-specific character sheets as well. I'll tell you now that all copies of the book i can find on the net' are in black and white; sorry for that. :\ if you prefer, they sell used copies of the book on amazon for fairly cheap (15-20 bucks), so if you want a hard copy, they're not hard to come by. just make sure you send me the link to the one you're getting first, so i can make sure it's right one. Ah, Ashberg. A city that's mediocre at best for humans, shakey for Changelings. While there are wells of glamour being kicked up by the excitement of the big city, the gathering of creative minds, and the large red-light district, on the whole Ashberg is a rather banal place to live. it could, by all means, be a lot worse, but this ain't no Narnia. This is a map of Ashberg's Subway. it covers the entirety of the city, as well as outlying suburbs. 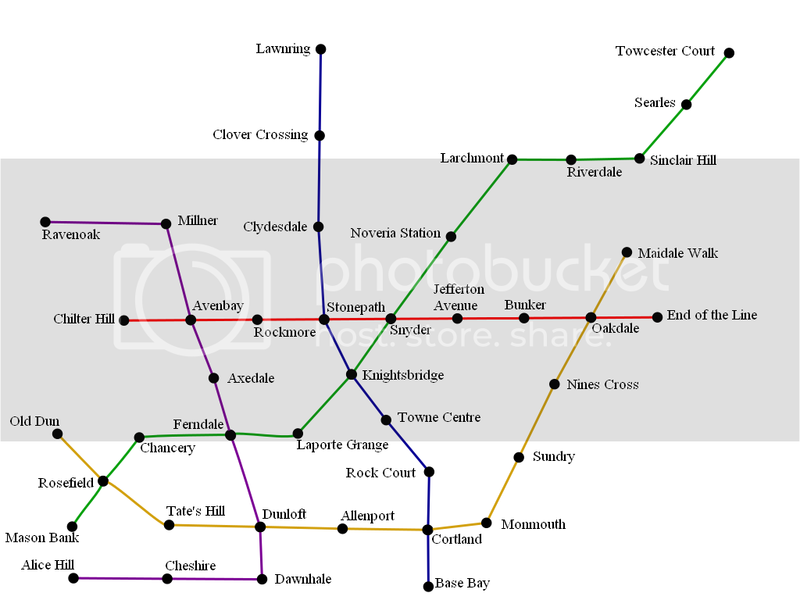 It has 5 coloured lines, with most of the terminus stations ending in some form of suburbs. This provides the main source of transit for Changelings. Chilter Hill Academy: A rather grey boarding school in the rather grey suburb of Chilter Hill, located at the west end of the red line. Banality seeps through the area, fought off only by the small freehold located near the school. The population of the area consists mostly of families whose children attend the school, along with nuns and Grump Changelings (some of whom have children who attend the school). Nearby is St. Josephine's Church, a small but devout congregation, who makes a major contribution to the banality level in the area. Chester Square: The city's Red Light District, located towards the west side of the city, off the Rockmore stop. With one of the main roads of the city, Hope Street, running through it, The Square pulses with life. This area is one of the best for Changelings due to the high concentration of glamour, but also one of the worst due to the high number of residents of the World of Darkness. Mages, Werecreatures, Vampires, Wraiths, and Changelings all congregate here, along with humans and hunters. While this might be a great place to make friends, it's also an easy place to make enemies. Despite this, Chester Square isn't that bad of a place to be, with shopping, restaurants, bars, cheap housing, and various "attractions" dotting the landscape. The Square also overlaps with the city's Chinatown, which hosts its own crop of Asian Enchanted. Base Bay: A rather large bay to the south of the city, Base Bay is home to both Orange Blossom Beach and Base Bay Sewage Treatment Facility. While it makes a rather nice summer destination, it leaves one to question just what one is swimming in. A hot spot for aquatic Changelings, especially post and pre season, Base Bay is an alright place if one is willing to look past the grime. It is accessible mainly by the southern terminus of the blue line. Morrows Square: A much smaller square than Chester Square, Morrows Square is located towards the east of the city and has Ferndale Road running through it. Something of a combination of Chester Square and the Shopping District, Morrows is a much milder place to be than either, and as a result it doesn't get much action. A good place to go if one wants to actually do what Chester and the Shopping District offer. Oakdale Apartment Complex: Located above Morrows Square, off of the Oakdale stop on the red line, Oakdale is a Low-rent housing offered mainly to working people from the city. Less rowdy than the apartments in Chester Square, Oakdale is quite peaceful despite what it could be or seems to be. As a result the place has a higher banality than it might otherwise, but the dreams of a better life are ripe here. Loose Ends Freehold: A small underground Freehold located in a section of subway tunnel past the End of the Line stop on the east end of the red line. Only accessible by subway (and only if the Freehold's gatekeeper allows it), Loose Ends is a small shanty-town of campfires and commoner Changelings. The Freehold, despite looking like a refuge for the destitute, is a very warm and welcoming place, and is willing to aid any WoD Resident in need, provided they are kind and peaceful in return. Occasionally, they are known to use their location to their advantage, trapping Residents there until they agree to help in some matter the Freehold can't handle themselves. I'll send it over skype. I should mention that most, if not all interactions for games will take place over skype, while planning will be split between here and skype. also, edited top post to show subway map instead of the link. EDIT: i'd like to pose a question of anyone who wants to play: i was considering recycling the previous arc from the game we played. basically taking it, and starting it over; it's tailor-made for this landscape, and we didn't get very far. plus, it's been a long time since we've played, so i doubt you'd remember enough to make for an unfair advantage. If you're rebooting it, I don't see a problem at all. I vote "Yay"
I've still got my character sheet. yay. ^^if you can get digital copies i'd like to review them, and partially since then i have a copy of everyone's. it'd be nice if everyone could have up to chapter 6 read (chapter 7 if you feel ambitious), if you haven't already. if you're already familiar with the material, go ahead and skim, but the early chapters provide the terminology while the later ones provide useful game info. also, did we do stuff like initiative rolls last time? if possible i'd like to do it more by the book, so we have consistency and fairness. i was planning on starting the fullmap of Ashberg later; i started coming up with more detailed maps, like finishing the map of Chester Square and the Shopping District. i doubt it'll be posted today, but by the end of the weekend expect it. and it'll be big, so i'd reccomend downloading it and using whatever picture viewer you prefer to see it. How about characters? Are we redoing anything there? My character needs no modification because I always play the same one. yeah, the intro kit seems to be sorely lacking in some basic terms and such. that said, reading the intro kit and then skimming the chapters might be an alright solution to this. the chapters often have tables filled with key info, so reading those might be good. to keep this thread alive, some updates! the city is almost done; i have 5 districts to go. specifically, Chilter Hill and Alice Hill were completed today, and i'll put them into the official map later. if anyone wants to have input on the remaining 5, or have looks at the rough sketches, let me know! I've started typing and revising the plot. namely i'm expanding a few scenes and patching a couple plot holes. if anyone has a freehold or a special location in the game that they lay claim to (a nightclub they own, a shop they run/work at, a school they attend), i'd like a description or input in making one (this includes naming the place if it doesn't have one already). this can be an interesting way to give your character some depth; as changeling are dual characters, they have dual natures. we see so much of the supernatural side, it leaves one to wonder, what's the mundane half like? do they have a job, and if so what and where? what's their family like? do they have any hobbies or favourite places? Let me check, I'm pretty sure my guy's got something going in the city.